The AMD rumor mill has been busy of late, but not quite as busy as AMD themselves. The company are planning to enter 2017 with a bang, fully replacing its processor lineup with Zen and readying to release Vega, which is the follow up to their highly successful Polaris range of graphics cards. But AMD have just filed a few new trademarks, two of which sounding suspiciously like something focused around Zen. ‘Ryzen’ was first filed back on ‘2016-07-28″ and there’s precious little information about what exactly it does. The description naturally lists Advanced Micro Devices (AMD) as the owner of Ryzen, and also notes the product as a “Semiconductor devices; semiconductor chips; semiconductors; computer hardware; microprocessor modules; chip sets, integrated circuits; graphics processors; and accelerated processors”. We can only speculate it’s either going to be an official name for one of the Zen processor models (or perhaps an APU). The next is ‘ThreadRipper’ which was first filed back on the 25 October, 2016. Once again there’s little information on exactly what it does, with the description being super vague “Semiconductor devices; semiconductor chips; semiconductors; computer hardware; microprocessor modules; microprocessor subsystems; computer hardware subsystems; computer subsystems; graphics software; chipsets; integrated circuits; graphics processors; accelerated processors; graphics cards; video cards; video game software; computer software; video game consoles; virtual reality headsets; computer workstations; computer servers; solid state drives; volatile memory and dynamic random-access memory”. But the name ThreadRipper (especially given that it’s almost certainly something to do with Zen) makes us assume it is something to do with AMD’s answer to Intel’s HyperThreading. 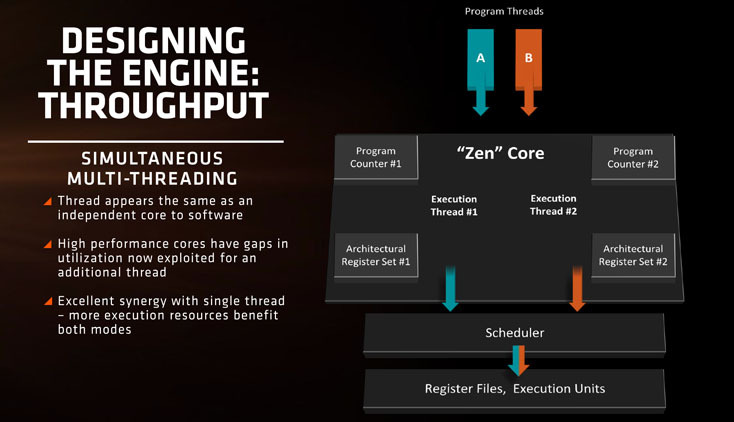 One of the biggest improvements with Zen is the chips ability to schedule two threads on the same core (so for example, an 8 core processor can handle 16 hardware threads). Intel’s HyperThreading isn’t a unique piece of technology, and SMT (Simultaneous Multi Threading) has been around for a number of years, and other companies such as IBM have used the technology to great effect. We can make the assumption therefore that AMD what to build a brand around ThreadRipper, and can certify CPU’s as ‘ThreadRipper enabled’. Another possibility is that it’s not the actual function of SMT on the chip itself, but rather a piece of software or other function devised to spread physical threads across multiple processor cores and distribute workload. But for now we’ll assume that the technology is the name for AMD’s own SMT. AMD JORO, AMD JITZU, AMD GROK are three other patents the company have filed – and unfortunately their names are so non descriptive it’s hard to make an educated guess as to what they are. Purely speculatively it’s possible they’re versions of APUs AMD are developing – either for high end devices (such as servers) or low power systems such as 2-in-1’s and tablets. The AMD section of Reddit is going crazy with speculation right now (and also let me thank ElementII5, the user who spotted these filings). It’ll be an interesting few months to see what rabbits AMD pull out of their collective hats, and if the January 2017 launch date of Zen is accurate (along with the pricing) the company should have an extremely compelling product for gamer’s, power users and also those on a budget. Zen is said to be able to compete with Intel’s most expensive chips, and considering the price point of only around $300 for the 8 chip / 16 thread model (known it seems as SR7 / Summit Ridge 7) it might make Intel sweat out much of 2017. For a technical analysis of Zen feel free to checkout our article here. As usual stick with as at RedGamingTech for more! Thanks once again to Rod .R via FB for yet another tip!